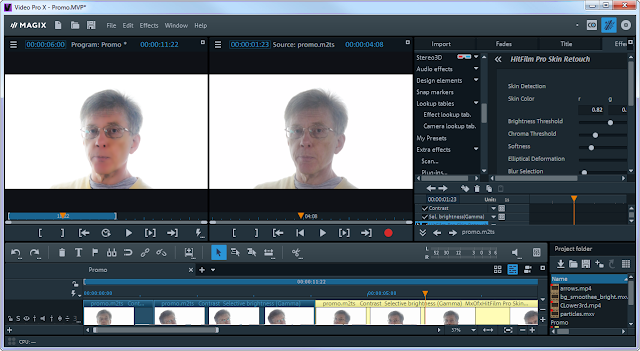 Cyberlink PowerDirector is a fast and well-featured video editing suite that is, in my experience, far more powerful than its relatively low cost might suggest. This latest release adds in some useful capabilities such as enhanced tools for creating panoramic 360-degree videos (assuming you have an appropriate camera) including ‘little planet’ videos (where panoramas seem to wrap around to form a sphere) and titles that stay ‘inside’ the 3D space, better colour matching and grading tools to change the colour ‘temperatures’ of clips and match the tonal ranges of one clip with another. You can also create video collages. These are split-screen videos with clips arranged in predefined ‘patterns’ all on the same screen. There are numerous other new or enhanced features too. For example, there is improved stabilization that irons out any camera wobbles, even in 360 degree clips. And there are all kinds of new or improved add-ins for creating titles and applying effects (only with some editions – see below). If you regularly make use of musical backing tracks in your videos, the new ‘audio-ducking’ tool might be of use. This automatically lowers the sound on a ‘background’ track containing music or some other kind of ‘background audio’ when there is some dialogue on a ‘foreground’ track. My first attempts at audio-ducking were not entirely successful. I applied the default settings to a backing track and let PowerDirector analyse the other tracks (principally the main video track containing dialogue). It then made adjustments to the background music by increasing the volume in the pauses and decreasing it during speech. Then end result was a wild cacophony of loud music blasting out at unexpected moments. I had better luck when I adjusted the settings in the audio-ducking dialog to increase the sensitivity and ducking level. 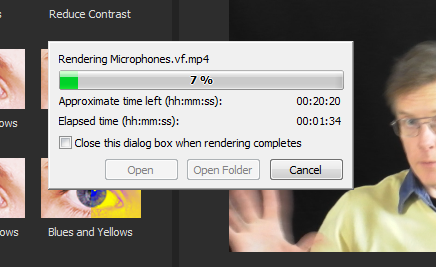 The end results were still not as good as when I made audio adjustments by hand. Even so, automatic audio-ducking is a lot faster than adjusting audio the hard way so it may be useful in some circumstances. Audio-ducking automatically decreases the volume of a backing track when there is foreground dialog. You may need to experiment with various options to get good results however. In spite of these additions, the essential software hasn’t really changed very much since the last release which I reviewed about a year ago. (See my review of PowerDirector 15). In fact, in terms of its core editing and production capabilities, it is really not vastly different from PowerDirector 14 (see my review from 2015). Consequently, for the sort of video editing that I do, which doesn’t need fancy effects such 360 degree panoramas and collages, the new features are not hugely important. The user interface remains much as it was previously: there are tabs across the top that let you switch between four workspaces: Capture, Edit, Produce and Create Disc. 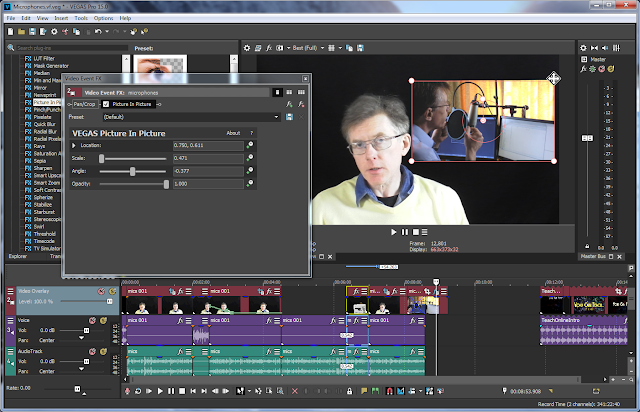 In the Capture workspace you can capture video or audio directly from a connected camera, microphone, webcam, CD or some other device, Or you can start up the screen-recording tool to make a recording of activity on your computer screen – which is useful if you need to do ‘screencasts’ showing software being used. The Edit workspace is where you actually create your videos by arranging clips on a timeline, cutting and moving them, applying effects and transitions as required. The Produce workspace is where you select the video format of your final video and render it to disk. And the Create Disc workspace is where you can, optionally, build a video complete with a menu system for DVD. The collage designer lets you edit together multiple video clips and show them in split-screen views. Here the collage designer lets me pick a pre-designed ‘collage’. As I’ve mentioned in previous reviews, one remarkable thing about PowerDirector is its speed of video rendering. 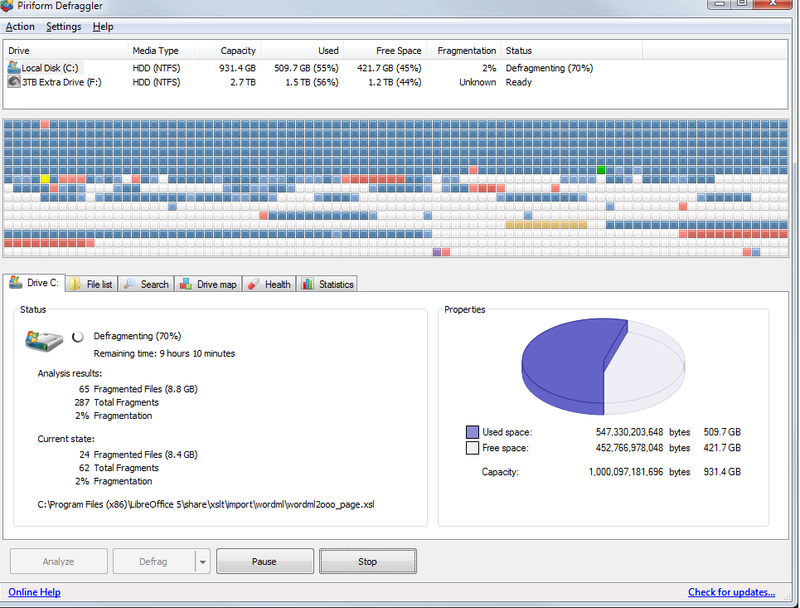 For some common formats (such as MP4) it produces videos at a speed that far exceeds any other software I’ve ever used. See my recent review of a competing video production suite, VEGAS Pro 15, for details of a comparative speed test I made between VEGAS and PowerDirector 15. So, in summary, PowerDirector 16 has a few useful new tools and features, the most striking of which is probably its improved support for 360 degree videos. It doesn’t really have many significant additions for more traditional types of video. Even so, it is an excellent program for fairly serious video makers and, at the price, it is terrific value. A word of warning. If you are a serious video maker, the chances are that you are going to visit the PowerDirector web site and notice that the software seems to be targeted towards families; there are lots of examples showing people making holiday and birthday videos. You will then, quite reasonably, conclude that PowerDirector is an amateur-level tool that must surely be unsuited to your more professional-level requirements. All I can say is, don’t believe it. While its ease of use makes it a perfectly good choice for amateur video makers, its power and speed make it just as good for professional use. OK, so maybe it hasn’t got what it takes for making Hollywood blockbusters. Then again, how many of are involved in making Hollywood blockbusters? Most professional video makers these days are more likely to be making YouTube videos, online video courses, instructional DVDs, promotional and sales videos or creative videos on a budget. 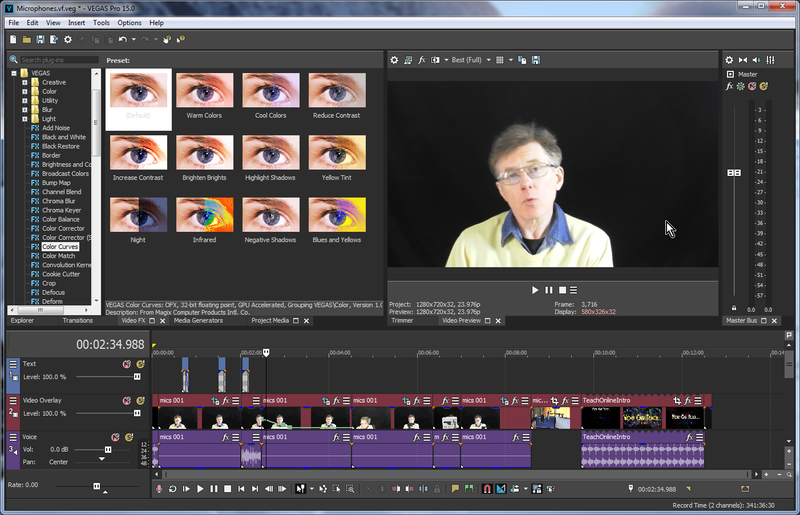 For that level of video-making PowerDirector 16 is just about ideal. Some editions of PowerDirector are supplied with additional software – notably, PhotoDirector 9 (image editing), Audio Director 8 (audio editing) and ColorDirector 6 (more advanced ‘colour grading’). The available editions are shown below. So which should you buy? For all the essential video editing features, the Ultra edition is fine. The Ultimate edition, which comes with additional plug-in effects is, at the time of writing, on offer at the same price as the Ultra edition, so that is obviously the one to get. If you need an image editor to work with still-camera images and bitmap graphics, the PowerDirector & PhotoDirector bundle is good value. The Ultimate Suite omits PhotoDirector but adds in colour-manipulation and audio editing packages – not really essential for many video-editing projects but possibly useful. However, if you are thinking of going for one of the more expensive bundles, then you may as well go for Director Suite which includes the full range of video, audio and image editing software. I’ve been using CorelDraw for a number of years as a (very) lightweight CAD package for simple mechanical drawings. It works quite well for that, in that you can add dimensions, use layers and colour items to get an idea of what you want to produce. But a 2D package that is aimed mainly at artists and illustrators doesn’t really cut it when you want to produce something like a simple right-angled mounting plate - let alone a robotic tracked vehicle. Nor, to be fair, is CorelDraw intended for that purpose. So I started looking for something a bit more 3D-oriented which would fit in with what I had used and knew in CorelDraw. CorelCAD seemed the obvious place to start. CorelCAD is essentially a re-packaged version of Graebert’s Ares Commander CAD system. It’s aimed squarely at AutoCAD-style users and as far as I can see does a pretty good job of it too. I’m no AutoCAD expert and, to be honest, the thought of using a command-line input to perform operations and using LISP as a programming language seem a bit, well, 1990s. But who am I to say? AutoCAD is doing very nicely thank you, and there are many happy users out there. This is a simple plate with a hole and a cylinder in the default wireframe view. Note the rather nice ‘ribbon’ menu which is an option over the older ‘classic’ menus. 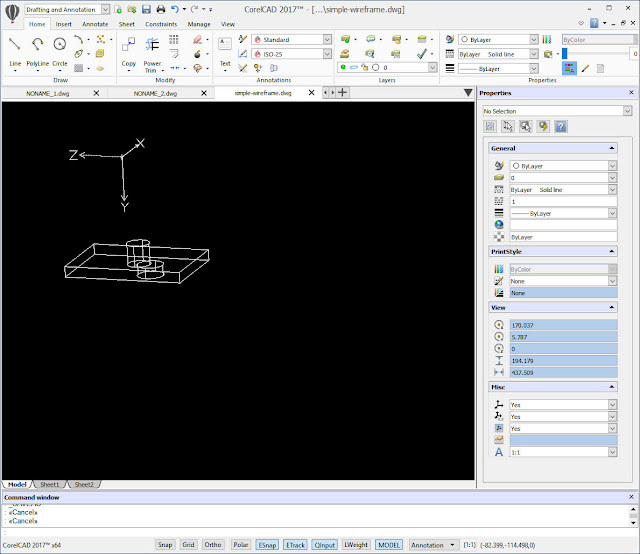 CorelCAD works in AutoCAD’s native DWG format and you can import and work with AutoCAD drawings directly. That’s a big plus – there are many manufacturers who produce CAD drawing in DWG format for download and incorporation into your designs. But you can also import and export to CorelDraw’s native CDR format. For me, the export worked ok, but I had difficulty with importing my existing mechanical designs. CorelCAD did import them – but the dimensions were not correct (they were page dimensions, not the dimensions I had specified in CorelDraw) and in some cases the relative sizes were not correct. I was hoping that I could import my existing CorelDraw diagrams and start working on them immediately. In the end I decided that it would be simpler to start again. With any CAD package there is going to be a learning curve. By all accounts CorelCAD is simpler to learn than AutoCAD but, even so, it’s a complicated and powerful design package and I found that it took me some time to get into producing even simple 3D objects. One of the rather strange things about CorelCAD is the help system. It really is the good old fashioned Windows XP style help. It’s comprehensive, true – but compared to the help provided with AutoCAD Fusion 360 or SolidWorks (with good short video tutorials and well laid out HTML pages on the web) it looks pretty antiquated. 2D drawings are easy, though. Even though the menus are different, I found that I could re-use much of what I knew from CorelDraw to lay out and align rectangles, etc. and specify the distance between various components – the dimensioning tools are first rate. I found the ‘Quick Input’ mechanism, where you can specify the dimensions of, say, a rectangle, on the fly to be particularly useful. As you might expect, the ability to accurately produce 2D layouts and plans is in a different ballpark to CorelDraw, and having using CorelCAD for drafting and creating 2D designs, I’d be reluctant to go back. You can ‘shade’ the wireframe to get an idea of what the finished item will look like. It’s ok but not wonderful. In addition to 2D work, CorelCAD also allows you to work with 3D objects. You can extrude a 2D surface to produce a 3D box, create spheres, wedges, cylinders, etc. and you can operate on them to generate holes and interiors. You can also create fillets and so on and ‘loft’ surfaces to generate 3D objects. I’m no architect, but I can see how this will work well for architectural designs in the traditional AutoCAD manner. However, for 3D mechanical designs, there are some issues. The first problem I had was to create a hole. Simple holes are fine, if a little unintuitive (you subtract a cylinder from a solid object), but what about an M3 machine screw hole with an 82 degree countersink? Or an M6 counter bore? Not so easy – ideally, I want a ‘hole’ menu which allows me do a number of common hole type operations. I would think that it is possible to create functions like this in CorelCAD by programming (in LISP) a routine that does exactly what you want. But I want to get on with designing my machine – not writing LISP scripts. 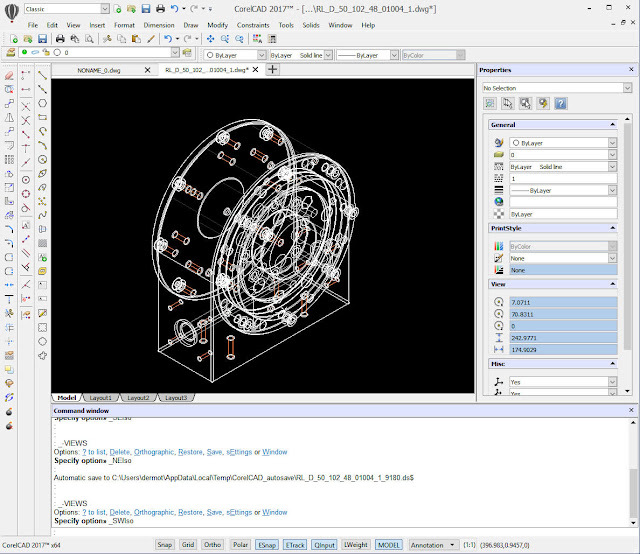 CorelCAD mainly operates in wire-frame mode. Typically, you would start off with a 2D ‘layout’ of a 3D design, and then extrude and move parts to where they need to be, while the display remains in wire-frame. Wire-frames, though, strike me as something of a throwback to the days when graphics cards and CPUs were not powerful enough to fully render 3D objects in real time. Times have changed and I prefer working in a fully rendered, rotatable 3D view all the time as in the Solidworks/AutoDesk Fusion 360 type of 3D CAD software. With these you create a 2D ‘sketch’ on any surface of an existing fully rendered 3D object and extrude 3D shapes from the sketch – to my mind a much more intuitive approach. The new QuickInput system allows you to specify dimensions ‘on screen’ rather than using the command line. An important feature that CorelCAD is missing for 3D work is ‘assembly’. In producing a full 3D ‘model’ of a robot, say, you would typically have a number of parts – ‘components’ – designed separately; and you then want to bring them all together as a fully functional composite object. 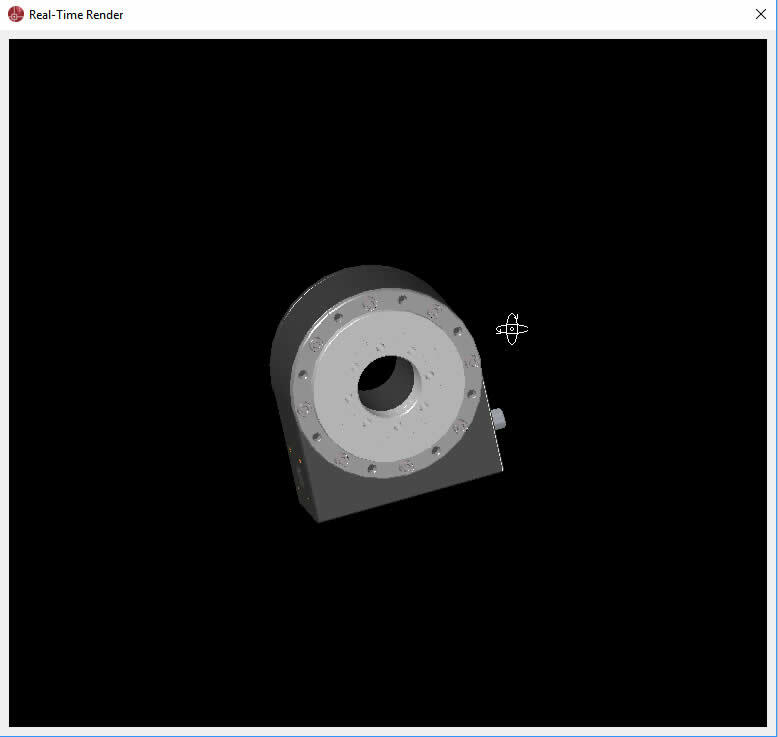 So, you really want to be able to select a gear shaft, say, and the center of a the hole in a gear and ‘join’ them, so that they align exactly, can rotate freely about a common axis and can then be moved and placed as one component. CorelCAD does have object ‘snaps’ where you can move an object to, for example, a position close to the middle of a line and it will snap to the mid-point. But this isn’t really the same as an assembly function. For me, assembly is essential. In researching which CAD package to use for designing robots, I’ve tried several CAD packages without assembly and it takes far longer to produce a workable model than with a CAD package with it. This is an example of a standard CAD file made available for download by a manufacturer (in this case igus - www.igus.com). Because CorelCAD works in native DWG format, importing files like this works perfectly. 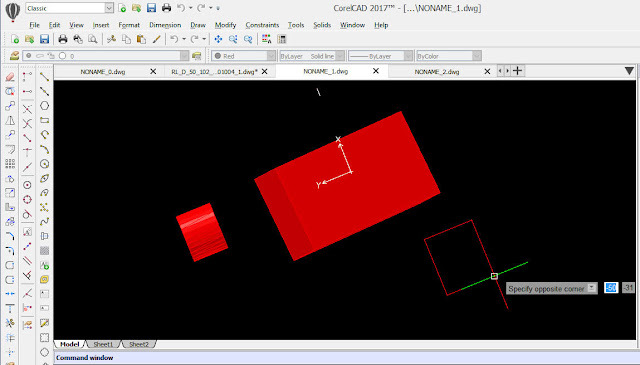 If you want to use CorelCAD for architecture, planning, office layouts or individual component design, assembly may be pretty much irrelevant. CorelCAD is excellent at producing 2D drawings and plans and it’s also good at 3D architectural designs, but there are better products available for complete mechanical designs. But there is one more feature of CorelCAD that you might like to consider: it has a ‘perpetual’ license. Many CAD systems – AutoCAD and SolidWorks, for example – require you to pay a yearly rental or subscription fee. For this you get the benefits of bug fixes, support and the latest releases of the software. You might think (as I do) that this is fine for the software vendor but not so good for those people who just wants to purchase something once and may consider upgrading after a few years. The CorelCAD perpetual license means that once you buy it, it’s yours to keep. To get a really good view of what you’re working with, you have to ‘animate’ the view. This is what I would like to work in all the time, but when you ‘animate’ a model, all you can do is rotate it and admire it. You cannot alter it while in this mode. No. CorelCAD is fine, as long as you are aware of its strengths and its limitations and use it appropriately. It is an excellent CAD package aimed at the AutoCAD (as opposed to full blown 3D design like SolidWorks) market. If you mainly want to produce 2D designs and 3D architectural drawings, it will serve you well. The 3D design functionality is adequate but if 3D mechanical design is your main purpose, there are better, more modern alternatives. But it’s a lot cheaper than AutoCAD (which currently costs £1,506 per year!) and it has a perpetual license. In short, I’m happy to design components and produce 2D layouts with CorelCAD, but I wouldn’t want to design a jet engine in it! C# (C-Sharp) is an object oriented programming language or OOP for short. Many modern language such as C++, Objective-C, Java, Ruby and Python are also object oriented. You can think of an object as a sort of package that wraps up data – that’s variables, such as strings and numbers – and behaviour – that’s functions or methods that do something, often by manipulating an object’s internal data. The definition of an object is called its class. You can think of a class as a blueprint for an object. It’s just like the blueprint for a car. The blueprint defines all the fundamental features of a car but you can’t actually drive the blueprint. To use a car you have to create one based on the blueprint’s definition. That’s what you do in programming too. You write a class and you create usable objects from it. In fact, just as you can create many cars based on a single blueprint, so you can create many objects based on a single class. When you create a new object from a class, you can call that class’s constructor to initialize the object. A constructor is a method that has the same name as the class itself. This class is called MyClass, so the constructor method will also be called MyClass. The constructor has to be public – that is, it has to be visible to code outside the class itself – because clearly I need to call the constructor method from other parts of my program, whenever I want to create a new MyClass object. A constructor doesn’t have to have any parameters. However, when an object has some internal fields, it is quite common for the constructor to define a list of parameters to initialize those fields. In that case, when you invoke the constructor, to create a new object, you would need to pass the appropriate arguments to initialize those fields. When an object descends from another object and the object from which it descends has a constructor that initializes some fields, the descendent class’s constructor can call the ancestor class’s constructor, passing to it any arguments required by the ancestor constructor to initialize its fields. It does that by putting a colon after the parameter list of the constructor, then the keyword base, then a comma-separated list of arguments between parentheses. This short video (taken from my course ‘Learn C# Programming (in ten easy steps)’ gives a few more details about C# constructors. PLUS: The entire version 1 course as a free download! Let’s now look at how pointers and addresses work in C – and why arrays are special. In the code shown above I declare two string variables, str1 and str2. You can create string variables using either syntax but you need to understand that these two variables are by no means the same as one another. The first, str1, declared with a pair of square brackets is an array. The second, str2, declared using the star operator, *, is a pointer. As we know (see previous article), an array and an address are equivalent. So str1 is the address at which the array of characters in the string “Hello” are stored. But str2 is a pointer whose value is not the string “Goodbye” but the address of that string. So str2 'points to' the address at which the characters “Goodbye” are stored. This should be clearer when you run the code. When displayed as an integer value, the address of str1 (returned by the & address-of operator) is the same as the value of the variable str1 itself. That’s because str1 is an array - and an array is, in effect, an address. But the address of str2 (returned by the & address-of operator) is different from the value of the str2 variable. Here the address gives us the location in memory of the pointer variable, str2. But the value of that variable is the address of the array of chars to which it points. str1 is the location of the start of this array of characters, “Hello”, in computer memory. The address of str1 is the location where that string of chars begins. But the value of the pointer variable str2 is a number that gives the location of the start of the array of characters “Goodbye” in computer memory. The address of str2 is the location where the str2 pointer variable is stored – and if we just want to get at data in the array, the address of the pointer variable itself is of no interest to us. For now, I’m only interested in the address of the array to which this pointer points. The value of str2 is the address of that array: the address of the first character in the string “Goodbye”. Beware. While one equals sign = is used to assign a value, two equals signs == are used to test a condition. = this is the assignment operator. == this is the equality operator. Some assignment operators in C perform a calculation prior to assigning the result to a variable. This table shows some examples of common ‘compound assignment operators’ along with the non-compound equivalent. It is up to you which syntax you prefer to use in your own code. Many C and C++ programmers prefer the terser form as in: a += b. But the same effect is achieved using the slightly longer form as in: a = a + b.
iClone 7 is a 3D animation package. It lets you create and render scenes populated with animated figures. 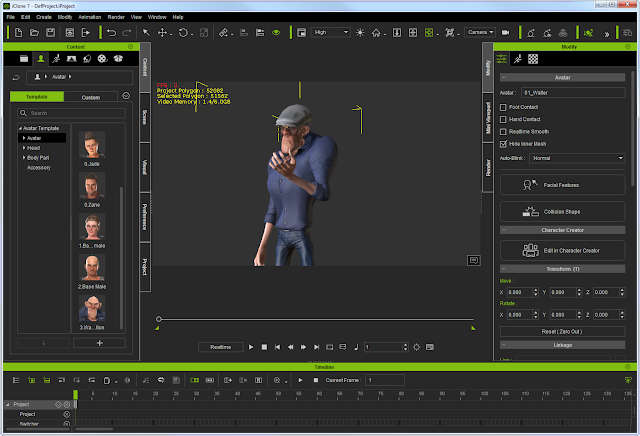 It provides realtime animation, so that you can view your animation as you create it rather than being forced to wait until it is rendered. It can be used either for creating animations from scratch or it can exchange data with other packages including game development software such as Unity or general-purposes modelling and animation software such as Maya, 3ds Max and Blender. It can also be used for creating still images and for designing figures and animations to be used in games created using packages such as Unity 3D or Unreal (though you may need additional tools and licenses to use some exporting options). 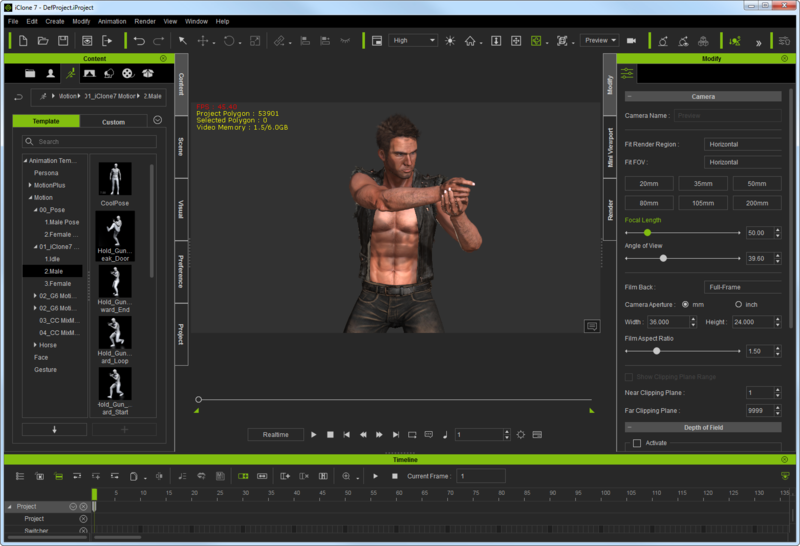 iClone 7 is a 3D animation package. Here I am editing a supplied cartoon-like figure. I’ve added two props (a hat and dark glasses) and applied a predefined pose. Let’s see how you get started. First, let’s suppose you want to animate a character. You can use a pre-designed figure by selectin one from the Content panel and dropping it right into the main edition area. Here you can tailor the figure as required by morphing and shaping it. You can do that using dialog boxes to set parameters to change the width of the mouth, the length of the hair, the figure’s height, muscularity and so on. 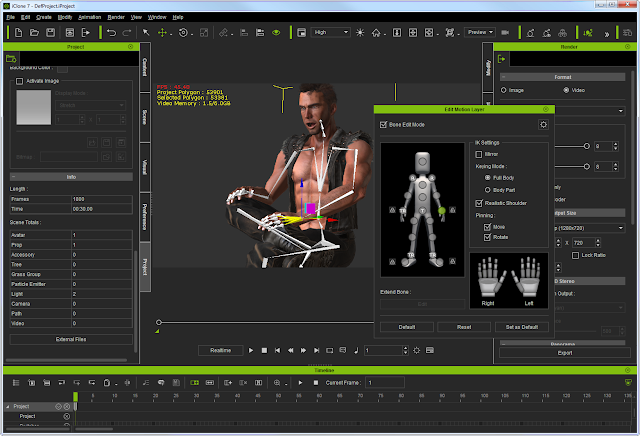 Then you can go on to add clothes from a supplied library and use a timeline editor to modify and animate the figure’s movement and facial expressions. You can also create entire scenes by arranging objects – chairs, doors, stairways and so on - and you can use the software to make adjustments to the lighting, including subtle effects from multiple-light sources and reflections from surfaces. 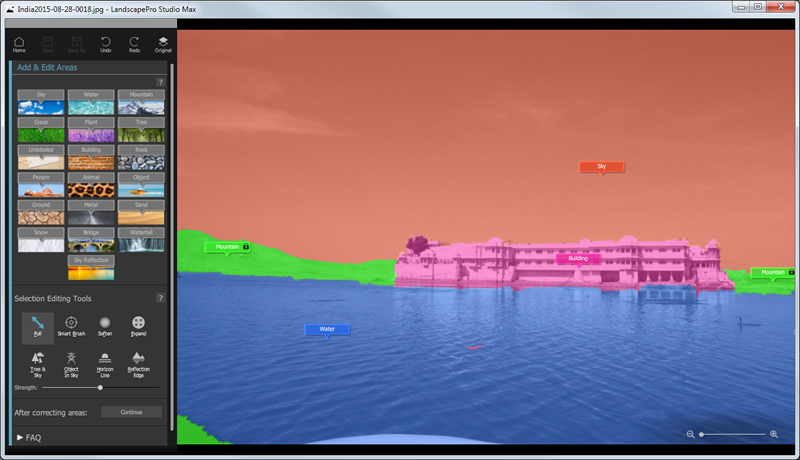 For advanced video-makers, there is even the ability to use simulations of real-world cameras to ‘film’ the action using settings based on specific real-world camera models. The video below provides a short overview of some of the most significant new features in this release. This is undoubtedly a powerful product. But, if you are new to iClone (as I am), how easy is it to learn to use? Well, in my experience, it is by no means easy as it could be. The user interface looks really slick but it is also very, very complicated. There is a menu system across the top - File, Edit, Create, Modify etc. – and each menu item shows a drop-down menu with many items having further levels of pop-out menus. Below this is a toolbar of icons covering features ranging from scaling and rotating to enabling global illumination and setting constraints. Then there are multi-page docked panels at the sides (Template, Animation, Stage, Modify and more) which are furher complicated by sub-selecting side-tabs (Content, Scene, Visual), nested pages (Template, Custom) which contain collapsible outlines of items (Characters, GI, Morph and so forth) used to browse folders of items shown in yet another nested pane. The arrangement of views can be altered by selecting various workspaces from a menu (Standard, Visual Effects, Animation etc.) and in some of these workspaces an animation Timeline appears down at the bottom of the screen. But where exactly do I start? Several cups of coffee later, a browse through the online Help and a visit to the web site to watch some video tutorials and I am still not entirely sure… To give them their due, I have to say that Reallusion has a lot of online lessons and having watched a few I quickly discovered that I use iClone to create scenes, modify figures, add props, do facial animation and much more besides. But I didn’t find a simple “This is how to create your first iClone 7 project” lesson. Or “Your first ten minutes with iClone”. The online Help isn’t that helpful either. It starts with a detailed section on the user interface ‘Knowing The Environment’ which laboriously documents all the menus and panels before going on to explain optimal rendering settings and the various software capabilities – 3D character generation, Character Animation, Facial Animation and so on. Yes, this is no doubt a great reference. But even so, as a beginner – where do I start? The user interface is quite crowded, with panels, pages, buttons, icons, menus and folders all needing to be navigated. The editing is fast and good quality, though. Here I am posing one of the supplied figures. OK, so over the years I’ve used numerous graphics and animation packages – everything from general-purpose packages such as Cinema 4D and Blender to specialist packages such as Vue (for landscape design) and Poser (for character animation) so with a bit of playing about I was eventually able to work out how to create geometrical objects, add and modify characters and do some basic animation. Assuming you have previous experience, you too should probably be able to work out how to create and animate simple objects fairly quickly just by trial and error. 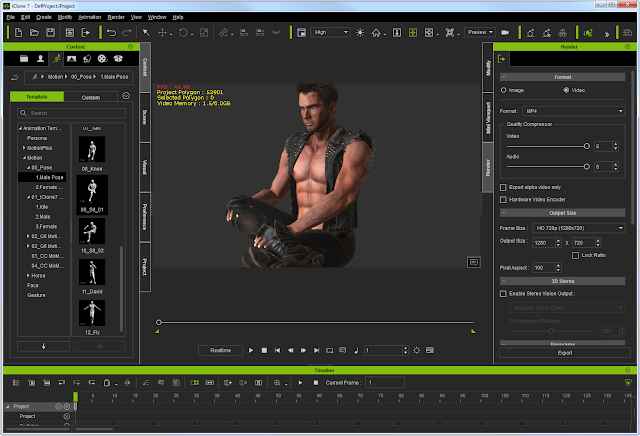 But if you are completely new to 3D design and animation, iClone doesn’t go out of its way to help you get going. Let’s assume that you stick with it long enough to get over the initial hurdles. The good news is that adding and animating objects is actually quite a fast and straightforward business once you know how. You can even animate cameras to, for example, follow an object or change its focal length to ‘zoom in’. You can make most of these changes by selecting specific ‘modes’ by clicking icons to scale, move or rotate objects but some things, such as camera focal length, need to be selected in one of the docked panels. 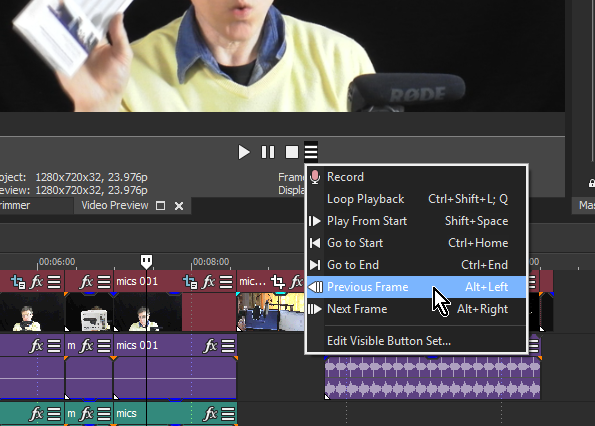 Each change is automatically added as a marker or ‘keyframe’ on the timeline and the motion between keyframes is automatically calculated by the software. Things start to get a bit more interesting when you use some of the supplied content. There are ready-to-use figures that can be dropped into the edit view ready for you to animate. To save time, you can even drop on some predefined poses and animations – for example, there is a ‘leaning against a wall’ pose and a ‘walking down a catwalk’ animation. When these are added, the figure immediately adopts the pose or follows the predefined animation. It’s worth noting, by the way, that (assuming your computer has the appropriate memory and graphic requirements – see below) the quality of the in-editor preview is extraordinarily good. The facial animation is slick too. The skin and muscles really do seem to respond pretty convincingly when a character moves its eyes, smiles or speaks. Here I’ve re-posed my figure just by dropping onto it one of the predefined poses. This will need some manual adjustments (his fingers seem to be going through his boots). Here I’m fixing the hand position using a feature called ‘Edit motion layer’ that lets me move virtual bones to repose the figure. You can also animate figures with predefined animations. When you’ve finished designing and animating you can render your video in a variety of formats and resolutions up to a theoretical 3840 x 2160 – but in fact when I tried to produce video at that resolution on my Windows 7 PC it warned me that 1920 x 1088 is the maximum possible on Windows 7 or 8. Overall, this is a remarkably capable package that lets you create and edit scenes, figures and animations and shows an impressively high resolution and fast preview of animations right inside the editing area. If you are already an experienced animator you will probably be able to ‘guess your way’ around the user interface to find the essential resources, properties, tools and timelines reasonably quickly. If you are not so experienced, however, the learning curve is likely to be steep. In spite of a fairly detailed manual and a good range of tutorial videos, this software really would benefit from one or more ‘quick start’ guides to get the new user up and running quickly. Bear in mind too that while it comes with a number of ready to use figures, props and scenes, these may not supply everything you need, depending of course on the type of project you are working on. Reallussion has many additional add-in packages that can fill the gaps. These include libraries of additional characters, monsters, talking heads, video effects and 3d assets. 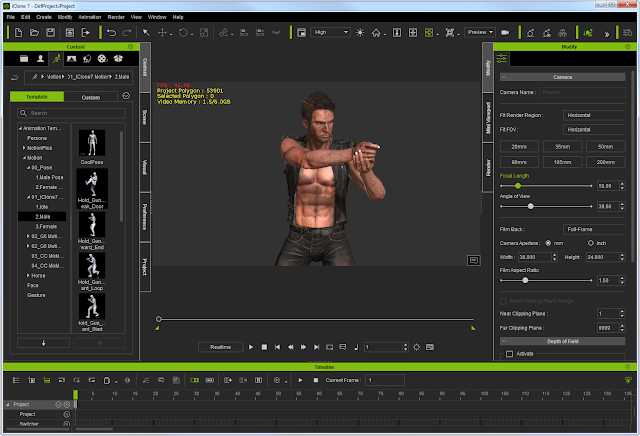 There are also plug-in tools for thing such as motion capture, Chroma key (green screen) and enhanced rendering. In fact, I suspect that the market for add-ins and additional content explain the relatively low price of the base software. True, you can do a great deal without paying for any of the added extras, but many of the optional add-ins are so darn’ useful that most serious iClone user will probably want to buy some of them at some point. Overall then, this is a good, low-cost animation package that could be both useful and fun for the serious amateur animator, graphic artist or video-maker. It does take some effort to learn but once you are over the initial hurdles, it really is quite impressive. If you plan to use it professionally, however, for example to create characters for 3D games you may need to buy some additional tools and content which could push up the price quite a bit. So you take a photo. Everything looks great. The arrangement of the sea, the mountains in the distance, the people in the foreground is just as you want it. The trouble is, it’s all a bit dull. The lighting is flat. The sky is dull. The water is as flat and boring as a mill pond. That is where Landscape Pro can help out. 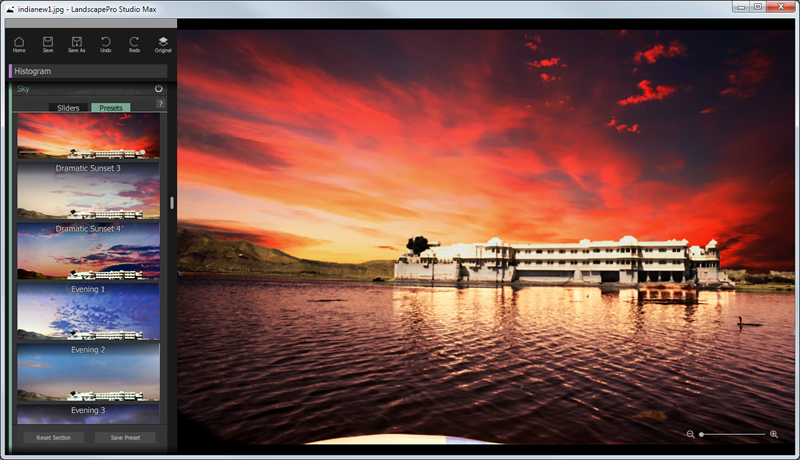 This program can change the lighting, the colours and the atmosphere of an image. 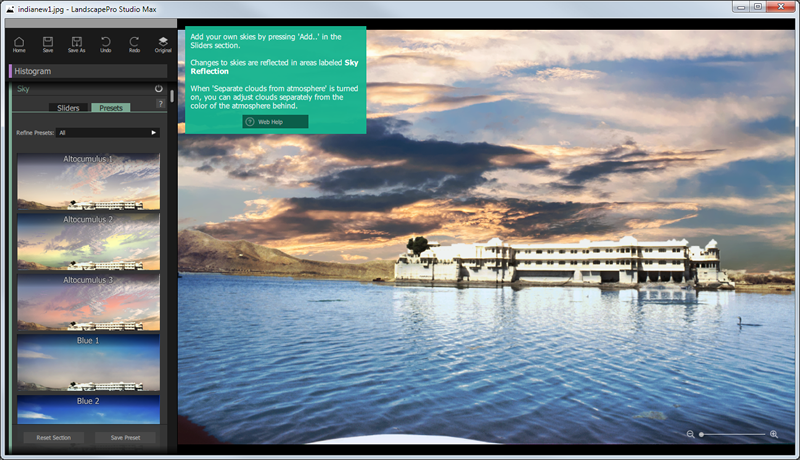 It does this by letting you select different image elements – sky, water, mountain, grass and so on – and then changing its visual properties such as the colour and brightness or by dropping in completely new images to, for example, substitute a dramatic cloudy sunset sky for a boring cloudless afternoon sky. 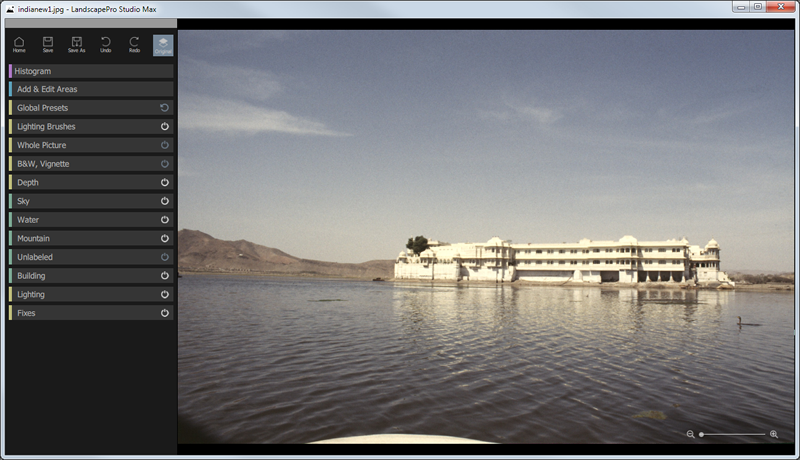 My boring holiday snap loaded into Landscape Pro 2. What can I do to add some drama to it? I reviewed the previous version of Landscape Pro HERE. For a quick overview of its features, be sure to read that review. This latest release is broadly similar in both look and operation to its predecessors. Some small improvements have been made to the user interface (including the addition of separate icons for the Save and Save As buttons which I criticised in my previous review). However, the most significant changes include a large expansion of the number of ‘presets’. So, for example, there are now over 100 new skies – that is, images of a daytime and night-time skies, sunsets, storms and unusual skies including rainbows and auroras. The selection tools have been improved and there is a new 3D lighting brush that lets you ‘paint’ lighting effects onto selected surfaces of structural objects and scenes. And one of my favourite improvements is the ability to make lakes and seas reflect the sky, producing more convincing results than hitherto. 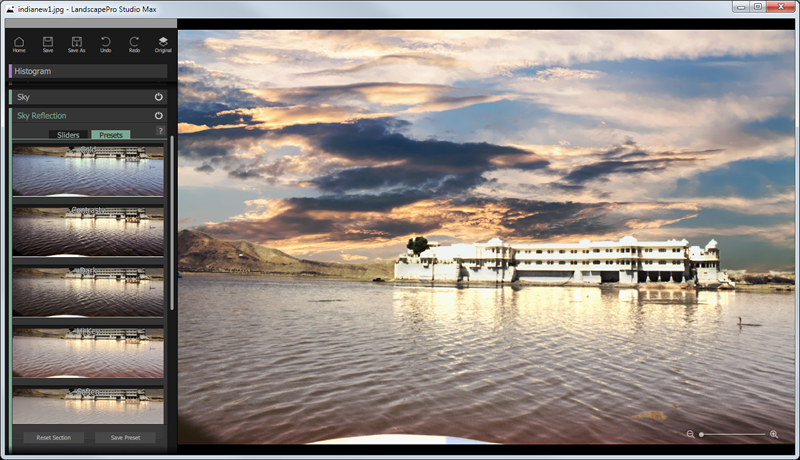 First you need to select important photo elements such as water, buildings and sky. Landscape Pro does this automatically and you can extend regions if it fails to get the boundaries exactly right. Then you can select presets from a panel on the left or use sliders to make fine adjustments to specific image elements, tones and colours. You can switch instantly from one preset to another. Notice here I have chosen to reflect the new sky in the water of the lake. And here I have selected a new sky to put my once quite dull scene into a dramatic sunset! All in all, this is a great product for anyone who wants to fix faults or add dramatic effects to landscape photographs. The regular price of £59.90 is quite reasonable but the current offer price of £29.95 makes it a really good buy. Little did I know when I wrote my first big computer program that it would end up as possibly the most enduring thing I’ve ever done. This was back in the early 1980s. Having decided to learn how to program, I bought myself a copy of Turbo Pascal and within weeks I’d embarked on writing a text-based adventure game of vast complexity (it’s more normal for a beginner programmer to begin by learning how to print “Hello world” but I obviously had ambitions well above my talents). Anyway, it took me a year to write that game, The Golden Wombat Of Destiny, and it was one of the most difficult things I’ve ever done. Also one of the most enjoyable. It taught me more about programming that I could ever have learnt if I’d followed a more traditional route. You can still download a copy of the game from THIS PAGE should you be interested. I also occasionally get letters saying something like “I really enjoyed playing your game when I was little. Now I’m playing it with my grand-daughter” (which makes my heart sink somewhat – it doesn’t really seem so long ago). Over the years I’ve also been approached by several people who wanted to turn The Wombat into a play or a film. None of these ventures has ever come to fruition. So I was, to say the least, surprised when Peter Theophilus-Bevis not only asked me if he could create a film musical about the Wombat but then went ahead and actually did it! Um, but before you watch it, here is the obligatory “author’s introduction” which will no doubt feature among the Extras on the DVD when the Director’s Cut is eventually released…. And here is The Golden Wombat Of Destiny epic musical movie itself…. Here I’ve applied one of the (admittedly fairly extreme) Lookup Table colour effects to a clip. The original clip is on the right. The one with the colour effects applied is on the left. Colour grading can be a fairly specialised area of video processing and high-end professional users may use a combination of expensive software and hardware (editing and mixing panels) for this job. By integrating a useful range of colour correction tools, Video Pro X seems to be trying to appeal to the ‘mid range’ professional video-maker. However, you need to be aware that, in spite of heavy promotion of this feature, Video Pro X does not provide a completely new ‘Colour Grading’ toolset (as I was expecting). Instead, the existing colour manipulation effects such as brightness/contrast, Colour, Colour Correction and Shot Match (the ability to automate make two video adopt the same range of colours and tonal values) have all been updated to provide greater (16-bit) colour accuracy. There are also sets of predefined colour schemes called ‘lookup tables’ which let you quickly apply to a clip a set of colour values with names such as ‘Cinematic’, ‘Neo’ and ‘Vintage’. The other principal changes to this release of Video Pro X are support for more video formats such as H.264 and HEVC/H.265; more control over audio processing for sound mixing and audio restoration; and various new effects including some new blurs and masks that can be ‘attached’ to moving images. It also does 360 degree ‘video stitching’ and exporting, assuming you have a camera capable of recording 360 degree videos. As I mentioned earlier, Video Pro X no longer uses version numbers. The idea is that rather than release a mass of updates all at once, when a new version is released, updates will be made incrementally as the software continues to be developed. The purchaser gets all new updates at no additional cost for one year. After that, you can carry on using your existing version but you will only get updates if you extend your ‘Update Service subscription’ at an additional cost. That cost is, in my view, rather high at £149 (199.99 Euros). I can’t say I’m terribly keen on this subscription model. When software is upgraded with a numbered release you should usually expect to see a definitive list of fairly substantial changes and you can then make an informed decision on whether or not the upgrade cost is worth it. By signing up to a ‘trickle through’ system of updates you have no real idea whether you are paying for major new features or just minor changes and bug fixes. The other thing I dislike about this ‘non-numbered’ update system is that new versions of the software overwrite older versions. If you have an older version that works and that you are happy with, that means that you cannot keep that installation while you evaluate a new release. I experienced a problem with this myself. When I installed the latest version, it failed to activate successfully online. I had to consult MAGIX technical support to find out how to remove an initialisation file in order to uninstall and reinstall the software and activate it as required. If a user had a similar – or even more catastrophic – problem with installation, there would be no way to revert back to the older release while that problem was solved because the new installation automatically removes any previous release. I think that’s essentially undesirable. MAGIX often has special deals and added extras on offer. At the time of writing, a bundle is offered including 3rd part effects such as the HitFilm Toolkit pack which I am using here to enhance skin tones. So, in short, how does this latest release compare with the previous one? Is it worth upgrading? The only ‘big’ new feature in this release is the integrated colour grading. Now, I don’t mean to underestimate the importance of this. If you want more control over colour temperature, saturation and so on, well, this will give it to you. And for artistic video-making – for example, if you want to convey mood and drama in your videos – that’s a good thing to have. But if that is not of compelling interest to you, then it seems to me that this new release is a bit thin on exciting new features. 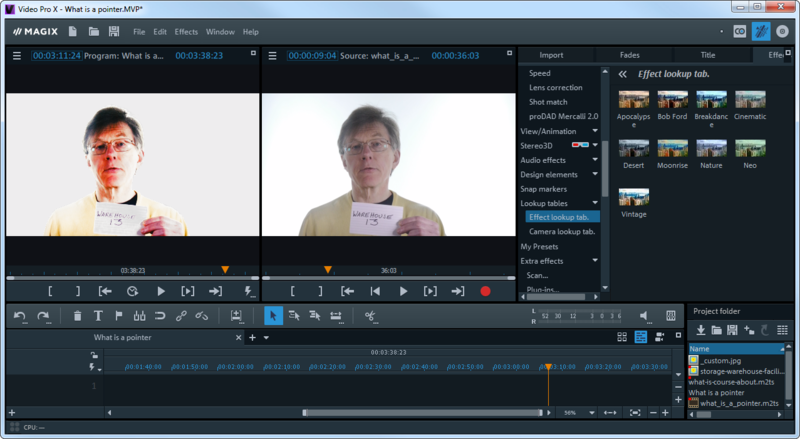 Video Pro X is a good general-purpose video editing application that (depending on your perspective) sits at the high end of the ‘serious amateur’ or low end of the ‘professional’ calibre products. MAGIX also markets the VEGAS video-editing suites, which it acquired from Sony (see my reviews of VEGAS Pro Edit 14 and VEGAS Movie Studio). As I’ve said previously, this large range of competing editions is confusing. It’s confusing to me and I can only assume it must be equally confusing to most potential customers. The various editions of VEGAS range from beginner to advanced level. It appears that the high-end VEGAS editions are now considered to be the more professional-level of the offerings from MAGIX since ‘upgrade’ deals are offered from Video Pro X to VEGAS Pro Edit ($199) or VEGAS Pro ($299). Video Pro X is pretty easy to use and has a decent range of features. Personally, I’d be happy to use it for most video-editing projects. As for the value of the new additions, though, that all depends on how much you need ‘deep colour grading’. If you don’t feel any compelling need for this feature, then this new release may seem somewhat underwhelming. This is part 3 of my series on C programming for beginners. When you want to store values in your programs you need to declare variables. A variable is simply a name (more formally, we’ll call it an ‘identifier’) to which some value can be assigned. A variable is like the programming equivalent of a labelled box. You might have a box labelled ‘Petty Cash’ or a variable named pettycash. Just as the contents of the box might vary (as money is put into it and taken out again), so the contents of a variable might change as new values are assigned to it. You assign a value using the equals sign (=). In C a variable is declared by stating its data-type (such as int for an integer variable or double for a floating-point variable) followed by the variable name. You can invent names for your variables and, as a general rule, it is best to make those names descriptive. There are several data types which can be used when declaring floating point variables in C. The float type represents single-precision numbers; double represents double-precision numbers and long double represents higher precision numbers. In this course, I shall normally use double for floating-point variables. Once again, I use printf to display the results. Remember that the three place--markers, %d, are replaced by the values of the three matching variables: subtotal, tax and grandtotal. The tax on 200 is 34, so the grand total is 234. But there is a problem here. If you can’t see what it is, try doing the same calculation using a calculator. If you calculate the tax, 200 * 0.175, the result you get should be 35. But my program shows the result to be 34. This is due to the fact that I have calculated using a floating-point number (the double variable, taxrate) but I have assigned the result to an integer number (the int variable, tax). An integer variable can only represent numbers with no fractional part so any values after the floating point are ignored. That has introduced an error into the code. This time all the variables are doubles so none of the values is truncated. I have also used the float %f specifiers to display the float values in the string which I have passed to the printf function. In fact, you will see that the format specifiers in the string also include a dot and a number numbers like this: %.2f. This tells printf to display at least two digits to the right of the decimal point. This series of C programming lessons is based on my book, The Little Book Of C, which is the course text for my online video-based course, C Programming For Beginners, which teaches C programming interactively in over 70 lessons including a source code archive, eBook and quizzes. For information on this courses see HERE.